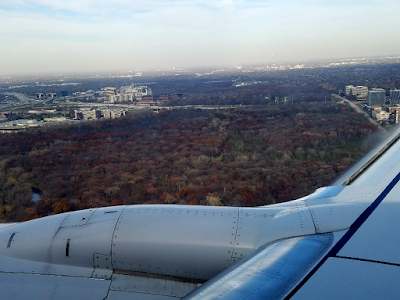 My next work assignment was to an area of the country that I know fairly well, Chicago! I grew up in the sleepy suburb of Elmhurst, in DuPage County. In this photo, the original white 1927 house I grew up in is pictured to the right of center. In its front yard is now a towering pine tree; what originally was a live Christmas tree that I helped my father plant back in 1970. It’s grown up a lot, and so have I! 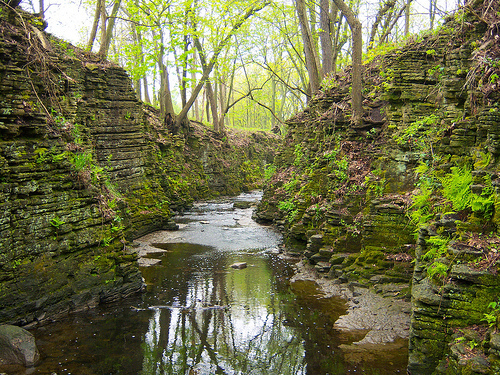 As a kid I was surrounded by the large green areas of the Prairie Path and the extensive network of dense, forested areas and lakes in the Forest Preserve District of Cook County. From its inception in 1913, it grew quickly in size to about 31,000 acres by 1929. 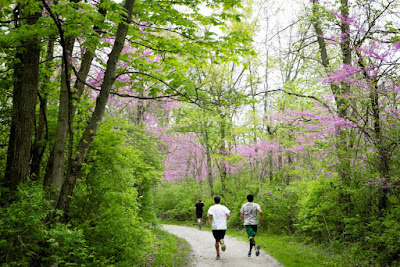 These forest preserves are comprised of almost 70,000 acres and contain the Brookfield Zoo, Chicago Botanic Gardens, 13 trail systems, 11 golf courses, 6 nature centers, 5 campgrounds and 3 aquatic centers. They even maintain a tree-top zip line course in Bemis Woods that was annexed in 2016. Adjoining Cook County to the west and north, DuPage, Kane, Lake and McHenry counties also have forest preserve districts of approximately 25,000, 21,000, 31,000 and 25,000 acres respectively. Combined with Cook County’s preserves, they contain over 268 square miles of forested areas. 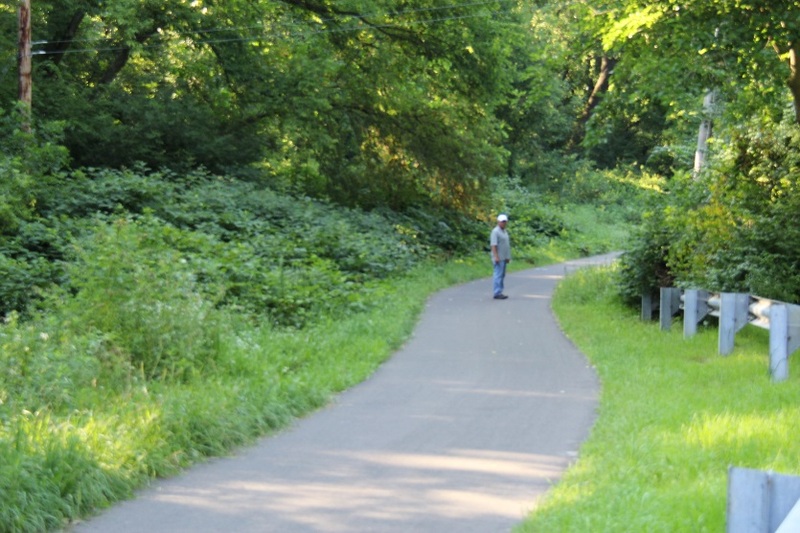 In addition, the Illinois Prairie Path, which was the first rail-to-trail project in the country, traverses 61 miles of wooded areas and connects with similar trails to the west. These preserves maintain biologically diverse, natural open spaces hosting rare native forests, woodlands, savannas, prairies, streams, lakes, riparian habitats and wetlands. As a kid, the Chicago Great Western and Chicago Northwestern railroad ran behind my house but was later converted into a green belt that parallels the Prairie Path through Elmhurst. I would explore these wooded areas along the tracks on foot with the neighborhood kids, when the only parental restriction was ‘be home for lunch’ or ‘be home before the street lights come on’. On our expeditions we saw large gardens filled with corn, squash, beans and tomatoes at the back of neighboring properties, apple trees, pear trees, wild raspberry and blackberry bushes and innumerable wild mulberry trees. We would invariably return home with stained tongues and fingers from harvesting these sweet berries. The rail line also had a trestle bridge over Salt Creek. The creek was always teeming with cattails, frogs, turtles, snails, and small fish. A cane pole was an imperative! We would also see deer, squirrels, raccoon, opossum and rabbits on our expeditions. When they finally closed the rail line, I vividly remember the engines they moved from the rail yard and roundhouse west of Elmhurst. There were many art deco beauties from the 1930’s and 40’s, and even one coal-fired steam locomotive that chugged past this young boy full of joy and wonder. In the evenings, long before the internet or smart phones, I’d sit and escape with my View-Master and look at exotic places and cities of the world and the raw, natural beauty of America and the wilderness in America’s National Park system. Some slides featuring the Grand Canyon and Carlsbad Caverns were vividly etched in my mind as I held that viewer against the soft glow of a 60-watt light bulb. Sometimes, it’s the little things in life that can burn lasting memories into our life tapestries. Before moving away in July 1972, two other events happened at that house in Elmhurst that I still remember and recall fondly with childhood wonder. 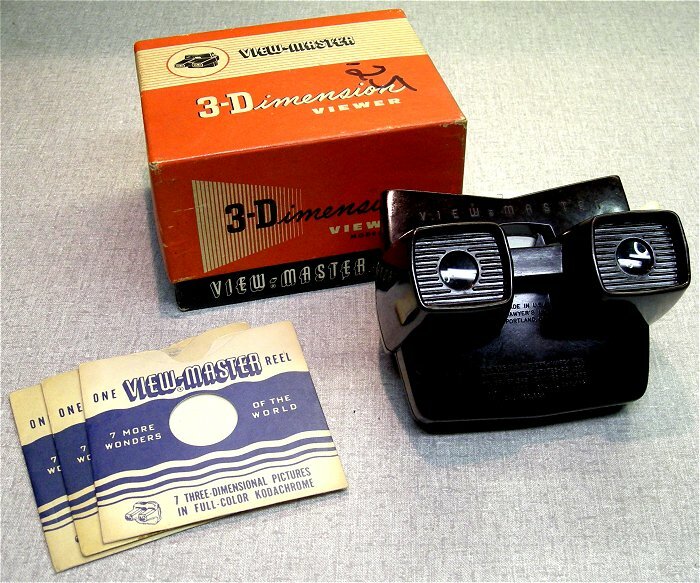 The first was the January 1965 copy of Reader’s Digest that was in the bathroom ‘library’. The article on the Oak Island Money Pit enticed this kid to make up pirate treasure maps and dream big. 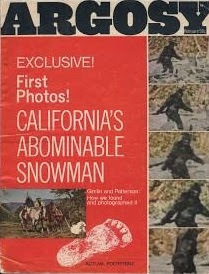 The second was the February 1968 Argosy magazine issue that published the first photographs of Roger Patterson’s creature he filmed, boldly proclaimed in full, slick color as ‘California’s Abominable Snowman’. I was drawn into the depths of both of these articles; full of adventure, mystery and the unknown. They made me realize that, perhaps, there are many things left to discover and understand in this amazing world in which we live. Before the internet, my only option was this stationary knowledge base called a library. I took quite a few trips on my bicycle to the library to do additional research on these topics, and even wrote a few book reports in grade school about these and others. Sometimes my teachers would raise an eyebrow. As a kid, I consumed every map, book and article about the Patterson/Gimlin encounter with their unknown creature. I drew conclusions that, given the scope of the forests and wilderness areas and the low density of human intrusion there, that the possibility of an unknown creature or creatures living there could not be ruled out. I did erroneously assume that their habitat only ranged from northern California into British Columbia. Over time, this research I had done was filed away and later tossed or boxed up during the move to Arizona. 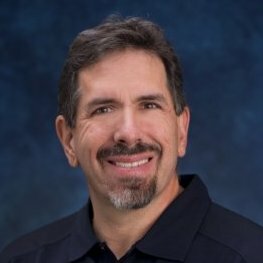 Once in Arizona, the dreams of Bigfoot and Oak Island faded but were replaced by ghost towns, Geronimo, Superstition Mountains and the Lost Dutchman gold mine legend. My dad held that same, inquisitive nature and encouraged a lot of my interests and dreams, but I always held fond memories of summer days in the forest preserves of Chicago. Knowing what I know now, especially after my experiences on Long Island with Sasquatch habitat in such close proximity to human activities, I began to eagerly look into the possibility of habitat and reports from this area of my childhood. To narrow the initial research areas but not necessarily limit the search grid, I always look at the Bigfoot Field Research Organization (BFRO) website, BFRO.NET, and look at any public reports listed for these cities, counties or woods. There are also numerous, other reports that are submitted to the BFRO that are not included on their public website. As I expected, there are numerous reports from the entire area; some Class A (actual sightings) and many Class B (footprints, sounds, glimpses). I went through the entire report listings and developed a map of the area, overlaid on the Forest Preserve map (indicated by red dots). 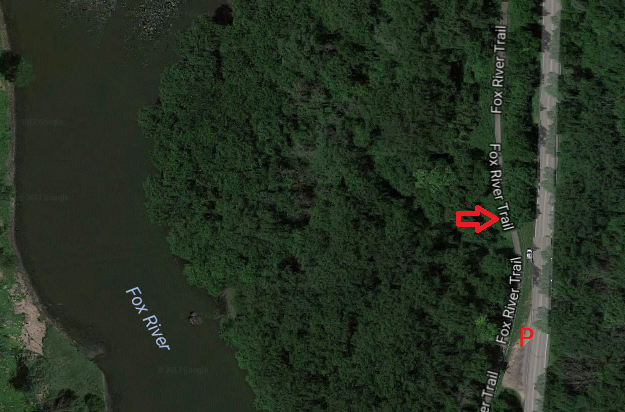 It seemed obvious that they are using the river and stream drainage corridors that are heavily wooded. These wooded corridors may not be completely unbroken nor very wide, but run the entire length of Illinois and into Wisconsin and Indiana. Armed with this knowledge, it’s apparent that a Bigfoot could easily run along those drainages and remain completely undetected. 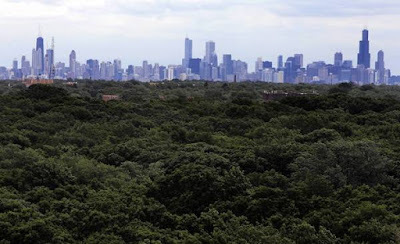 In stark contrast to Long Island, the Chicagoland area was rife with actual Bigfoot reports. I have had some odd experiences myself here in the past. In November 2011, I did a follow-up to a BFRO footprint report in DuPage County that had originally been reported in January 2011. The location was bordered by two major roads and had a large lake and wetlands. I parked in the empty parking lot, reached the trailhead and started in on the crushed gravel path loop that traversed the preserve. The path was dry, but you could see dog, coyote, raccoon, squirrel, mouse, bird, horse, deer and human tracks crisscrossing the pathway when it had been wet. Coyote and deer prints tended to bisect the trail, or followed the trail a short distance then led off into the woods. I reached a location just north of the lake, and found a grouping of Osage Orange trees. 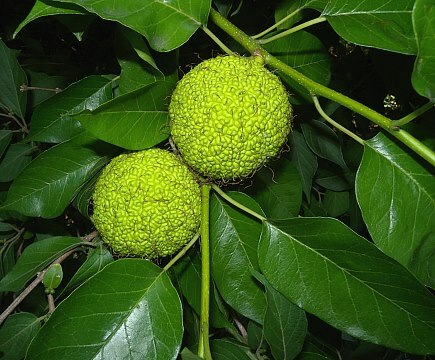 Osage Orange (Maclura pomifera) was introduced into Illinois to create windbreaks and to establish thorny hedges that could control the movement of farm animals. This is where the tree derived its common, local name of ‘hedge apple’. It is native to Texas, Oklahoma, and adjacent areas of the southern plains. It is thought that such ice-age megafauna as giant ground sloths, mastodons, mammoths, and/or gomphotheres may have been the primary consumers of the large heavy fruits, spreading the seeds to areas as far north as Minnesota. After these megafauna became extinct toward the end of the last ice age, this tree lost its ability to spread to new areas. As a result, it remained isolated in the southern plains, where it had been driven by the glaciers during the last ice age. I only was alerted to the small grove of Osage Orange, as one of the baseball-sized fruits fell from the tree as I was passing. I stepped off the trail through 30 feet of dense brush to collect the fruit. I examined the tree, and noticed that some of the fruit on the ground was bitten completely in half. They were still oozing a milky latex-like liquid. Squirrels like the fruit, but deer and other animals dislike them. I wasn’t sure what had cleaved these fruits. 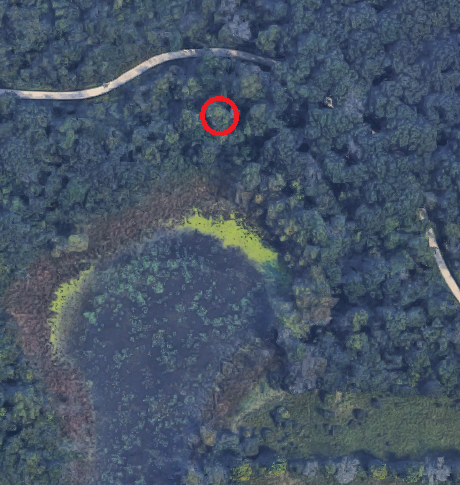 I turned to walk back to the trail and something large, 60 feet south of me, bolted from its hidden location. I spun back around but could only see vegetation still swaying from its passing. The unknown animal crashed through brush for an additional 5 seconds, then the woods returned to perfect silence again. 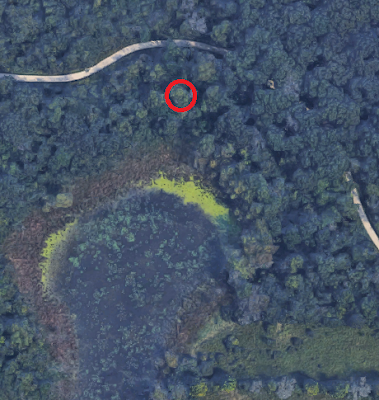 I would have gone back further to examine the area that had concealed it, but the ground was soggy and marshy in that direction (area circled in red). I gathered my wits, and continued hiking through the preserve. I did find some interesting tree breaks and twists, and two bedding areas. One bed was just tall grasses matted down, and likely was from deer. The other one had matted grass as well as other vegetation that had been placed down in the center. These limbs and brush were from trees 30-60 feet away from the bed. 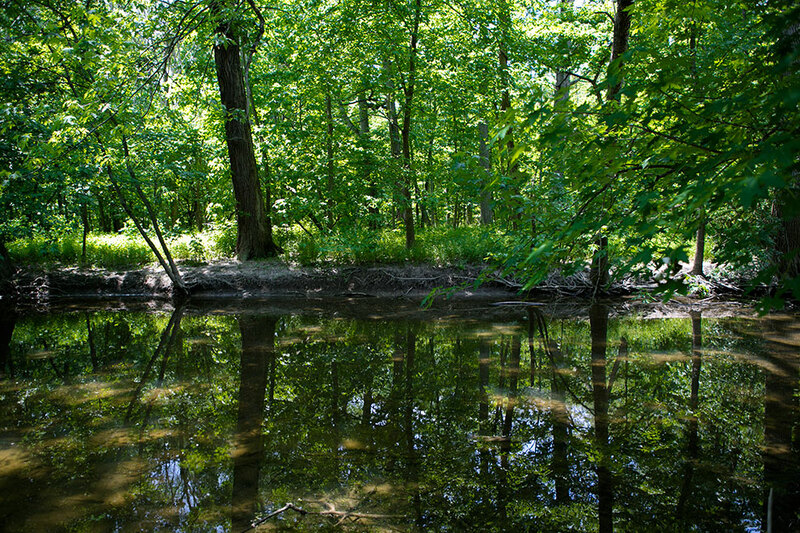 This area’s habitat is ideal with plenty of access to other preserves, water, food, and vegetation/cover off-trail. Whatever bolted from the Osage Orange grove was large and at least deer-sized. I still wonder why it didn’t run as I walked directly toward it, and why it bolted when I turned my back on it. I’ve never experienced that behavior before from a deer. Based on the constructed bedding I found combined with the discovery of half-eaten Osage fruit, circumstantial evidence would suggest there are Bigfoot living in that forest preserve. 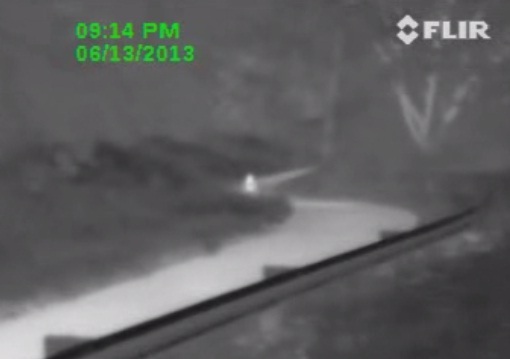 On June 13, 2013, I had been on another business trip to Chicago and decided to do a follow-up night investigation to a few BFRO reports up near Algonquin, IL; specifically report #29448 of a track way found in the snow in February. I had been staying in St. Charles for work and finished up late, around 10 p.m. I went back to the hotel and loaded new batteries into my FLIR HS-324 thermal camera and headed north to an area just south of Algonquin near the Fox River Trail (Prairie Path) on the Fox River. I arrived at the location at midnight (regardless of what the time stamp on the thermal recorded). I got out of the car and listened to the night. It was a mild summer night with the temperature at 57F and 81% humidity. A spring on the east side of the road bubbled and trickled across the pavement, down into drains on the west side of the road that poured into the Fox River. The area was very dark with the street illuminated by a lone light about 500 feet to the north. After a while, I fired up the thermal and decided to do a soft whoop. Nothing responded. I waited five minutes and did another soft whoop. I continued to scan the tree line in front of me, and down the path south to north from my location just off the road. To the north, a very hot heat signature appeared and was walking toward my location (0:50). It stopped, paused and seemed to be looking at me, then retreated to the north and gave me the impression of dodging behind a nearby tree (1:35). This behavior got me pretty excited. I slowly walked from where the car was parked to hopefully get a better view of the subject. As I got closer, I was extremely cautious as the subject had been obviously vertical but now was either crouched or possibly laying down. As I finally got as close as I dared it became clear to me. The subject was now sitting in the center of the path. It did not have a flashlight. This section of the Fox River Trail was completely covered by the tree canopies and was pitch black. Without a thermal imager or night vision, it was impossible to see anything. As great as the FLIR is for capturing heat signatures, you can't always tell you what you're looking at. I did several soft whoops. The subject rocked a little. I spoke some of the Sasquatch words that I’ve heard recorded before with my deep voice. The subject rocked a little. This went on almost 4 minutes, until the subject stood up and walked away (6:49). Unlike most FLIR images of a human figure, there doesn't seem to be any clothing detail, and yet it seems shaped more like a person. I was wearing jeans and a T-shirt, but the subject almost looked like he/she was wearing a jacket. I was disappointed, but rather than chasing down the path in the darkness, I decided to drive 1700 feet north to where the trail intersected a road. I was determined intercept the subject to clarify my thoughts once and for all of what I had seen. As I started back to the car, I heard a stick snap in woods in front of me. I spent almost 7 minutes searching the woods again with the thermal without hearing another sound or getting any hits. I finally fired up the car and drove into position down the road and waited. And waited. I waited 20 minutes and the subject never appeared on the Fox River Trail. Somewhere in between point A and point B, the subject had left the trail. There weren’t any points of interest in between, so it’s a mystery where he or she went. A month later I returned with my cousin, and was able to take measurements of the width of the path and posed my cousin in the same location. Based on the results, the subject was about 5’10” tall. 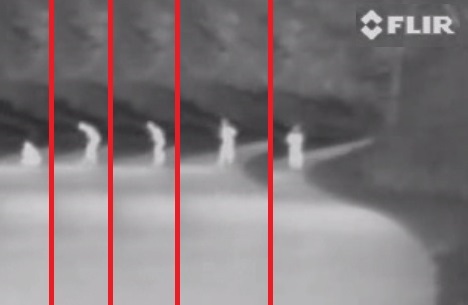 In further analysis of the thermal video, there was a distinct heat difference between its face and hair as the subject turned away. Directly to the west of where my cousin is standing are two large mulberry trees that were brimming with berries. As the subject stood up it appeared to put its hands in jacket pockets, but it is possible that it was cupping fruit in front of its body. My final assessment is that it was a human male. Why they walked a ½ mile in the dark without any flashlight, why they sat down on the trail, and where did they disappear after walking north will never be answered, unfortunately. It’s just very odd behavior. For the next bit of sleuthing I turned to previous research and reports by the paranormal organizations in the area, and there were a lot of them! 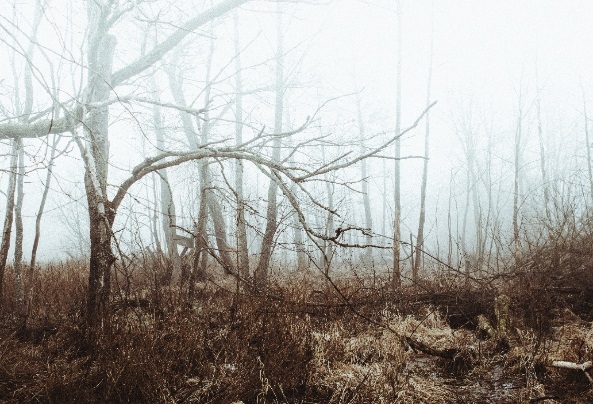 I found that there are numerous reports in and around cemeteries and preserves where ‘rocks were thrown at investigators out of thin air’, ‘disembodied voices could be heard’ or ‘eerie howls emanated from the woods’. 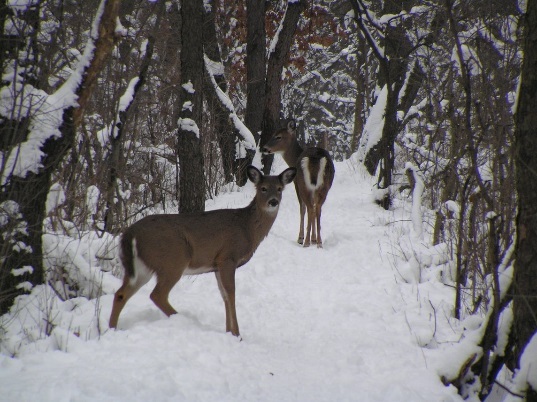 Every single one of these reports aligned with BFRO reports, or county forest preserves with ideal habitat. I believe that there are a substantial number of Bigfoot that call these forest preserves of Chicagoland home. The food and foraging sources, forested acreage and available water are ideally suited for their survival. I also believe that they are using the rivers, streams and creeks in this watershed as transit corridors to move undetected, especially at night. 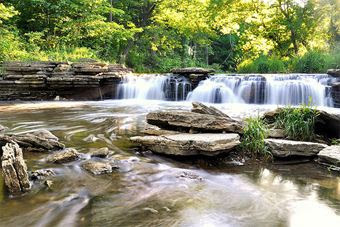 Travel from Indiana to Wisconsin is possible using these waterways. 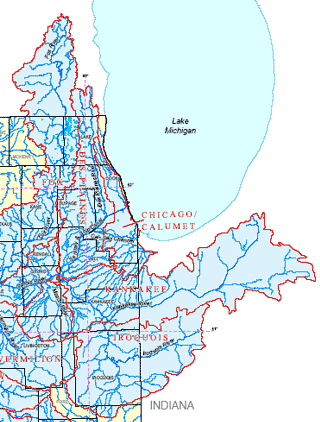 The map provided by the Illinois State Water Survey (2003) shows the extent of the watershed. After a review of BFRO reports overlaid onto the forest preserve area maps and factoring in my work location, I decided to narrow my focus of investigation to the Des Plaines and Fox River watersheds, and Poplar and Salt Creek basins. Stay tuned for upcoming reports on these areas. I won’t be specific and will withhold the exact locations of the research areas to insure that my observations are not spoiled by outside influence. I look forward to collecting evidence that will solidify what others have already seen or experienced of the elusive Chicago Sasquatch!